Just a few words about these images: please, please please do not steal them. If you would like to use them on one of your sites or social media channels, please just ask first and link back. That would be much appreciated. I decided not to use a filter on any of these photos in order to maintain the original colors. If the picture looks faded, that's probably because I'm old, and these stickers have been around for like, thirty years or more. I kept sticker books (and a file folder of stickers- crazy, I know) in the 1980's, but I also created a brand new sticker book in the year 2000 to share with my students. I took some of the stickers I had in my file folder and placed them in this album to share with them. So if some of the stickers look like they are in perfect condition, that's why! What? Doesn't every adult create the childhood sticker book of their dreams? Or is that just me? And these are my newer pages. You can see the difference, right? In the 1980's, sticker books were all the rage. We used to sit in a circle on the playground and trade with each other. Most kids had their stickers in old school photo albums, but there were a few store-bought albums available from Trend and CTP on the market. There were a variety of scratch and sniff stickers available. My oldest in the collection were made by CTP (these are a matte finish. The newer CTP stickers had a glossier finish). CTP also made scratch and sniff patches. I'm not sure what you were supposed to patch them on. Your jeans, maybe? *Gasp! * I couldn't bear to do that! They smelled so good, especially that orange one on top. And there were others known as Mello Smellos, and those icky Gordy ones that smelled like bad things (like garbage and dead fish- why??). But I had those, too. But perhaps the most well known were the variety created by Trend Enterprises. There are a few CTP and non-Trend varieties in here, but does it matter? All Trend stickers on this page! My mom (proudly referred to now as The Jersey Grandma) was a teacher back in the 80's, and sometimes she would take my sister and I to teacher supply stores. This was a dream come true for a sticker collector, because they sold scratch and sniff stickers in multi-packs in these types of stores, as well as certificates and bookmarks. My mom even went to some vendor events, where CTP had its own table. They would sometimes hand out bookmarks or stickers exclusive to that event (like the yellow bookmark in the photo below). Can you believe I hung onto this stuff all these years? Ironically, I had so many of the certificates and bookmarks that I actually used some of them in my own classroom when I became a teacher. My students were receiving vintage reward incentives! The ones in my collection now are all that remains, like the last glowing seed of Fantasia. Sigh. So I know there are sticker collectors out there ready to tell me about all of the types and varieties that these companies released (I know there were matte and glossy ones, I know there were first editions and rares and all of that stuff). But honestly, as much as I appreciate your knowledge, this post is not a guidebook for collectors. It's just a nostalgic trip down memory lane. 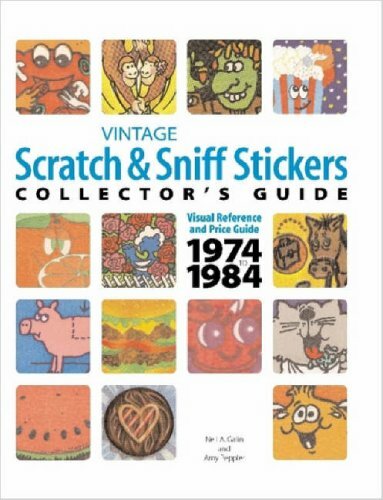 If you want to read all about vintage scratch and sniff stickers, you can check out the Amazon book, Vintage Scratch and Sniff Collector's Guide, by Neil A. Galin and Amy Peppler (that's my affiliate link). You can also visit Bubbledog's Online Eighties Scratch and Sniff Stickers, for a more organized look at them, and possibly to buy some, too. If you're still in love with all things stickery, or maybe you are inspired to create your own adult sticker book now, I included some handy dandy Amazon affiliate links below. too. You can read more about my Amazon affiliate links on my Disclosure page. Happy shopping! What a fun walk down memory lane. I used to love those stickers. I am going to have to get some for my daughter. Definitely!! I would love to revive this fad! Thanks for visiting. LOVE, LOVE, LOVE your site! I re-discovered "smelly" stickers recently and it prompted me to pull out my old sticker books and reminisce. I ordered some new vintage stickers off of eBay to start a book with my 6-year old daughter and I'm just as excited as I was back in the day! Thank you for the great information and too hope they bring back the original matte stickers because they still smell great after 30+ years! Loved reading this blog. I too loved and still do love, my old sticker books especially the sniffy ones. I joined a scratch and sniff sticker club for me! I have a puppy who loves scratch and sniff books, but I get sniffy things for me! I too am in NJ. Thanks for sharing your pics. Even just seeing them brings back such positive feelings! Aw, this made my day, thanks!! It makes me so happy to find other people who appreciate the 80's and those stickers we used to collect. Thanks for reading!